Sambar is the most popular south Indian recipe. Sambar is a lentil based stew cooked with vegetables and spices, simmered with tamarind juice. 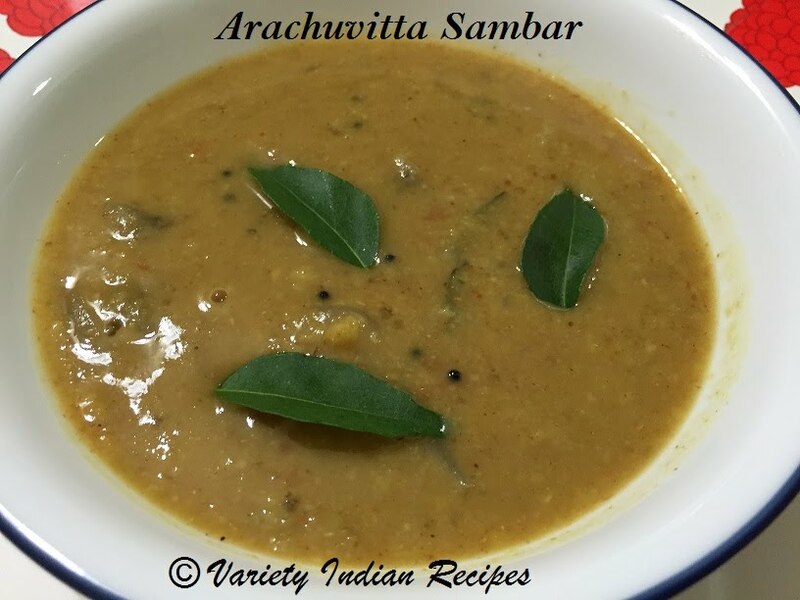 Arachuvitta sambar is a type of sambar where freshly ground masala is used instead of sambar powder, which gives it a unique taste. It tastes awesome with idly and dosa. Pour Oil in a pan, roast red chillies,channa dhal, fenugreek, grated coconut and coriander seeds until they become slightly brown. Cool the above roasted ingredients and grind them. Cook toor dhal in a cooker along with turmeric powder. Heat oil in a pan, add mustard seeds. Once the mustard seeds splutter, add fenugreek seeds and curry leaves. Now add onions , fry till the onions become translucent. Add tomatoes and saute well. Now add the grounded paste and saute. Add tamarind juice and mix well. Add a pinch of jaggery, ghee and add chopped coriander leaves and turn off the flame. Serve hot with idly or dosa.